You are here: Home / Ethnic Groups / The People of Sumatra / Who are the Riau Malay? The Riau Province of Sumatra is in Central Sumatra. While most Melayu Riau (Riau Malays) live on the mainland of Sumatra, other Riau peoples live on the 3,214 small islands that comprise the province of Riau Islands, just east of the Riau province. The two most developed islands in that province are Batam and Bintan, approximately 30-45 minutes by boat, south of Singapore. By far the largest and most dominant ethnic group in the Riau Province is the Melayu Riau, nevertheless there are many other ethnic groups that live among them. Each group guards its culture well. The Riau Malay language is part of the Malay language cluster. The Riau Malay have two dialects. One dialect is used in the islands and near the coast, while the other dialect is used on the Sumatran mainland. The Riau Malay language is used in traditional poetry, local proverbs, magic incantations, legends, romantic stories, and other forms to express the feelings of the people. The Riau Malay people make a living as fishermen and farmers. For those living on the islands, their way of life depends more on the ocean. Farming is limited because of inefficient farming methods. Most Melayu Riau live in wooden homes built on pilings along the length of the river or along the shoreline. They also build houseboats, placing a house on a floating raft. Besides functioning as houses, these can also be used as small stores. Historically, the Riau Malay have adhered to a bilateral lineage system in which lineage is traced through both the mother and the father. There are also those who use a patrilineal (from the father’s side) system, which is a result of Islamic teaching. Some others follow a matrilineal (from the mother’s side) system, due to Minangkabau influence. The basic family unit consists of the mother, father, and unmarried children. The Riau Malay have been influenced by Islamic, Hindu, Buddhist, and European cultures. 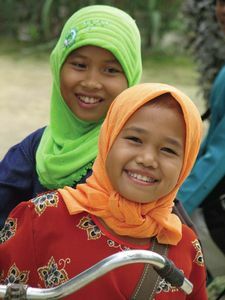 Islam influences almost every aspect of present day life for the Melayu Riau and parents emphasize religious education over formal education, particularly in primary school. At the same time, many common practices indicate the strong adherence to traditional spiritual beliefs–for example, potions used to ward off evil spirits. A shaman (called a bomo) is normally asked to drive out evil spirits which are believed to be the cause of sickness. They need appropriate farming technology for their land. Communication and ocean transport infrastructure are also pressing needs. Additionally, they need improved access to adequate medical services and midwives. Their standard of living is far below that enjoyed by more recent immigrants to the Riau Province. This is ironic given that this province gives more money to the central government’s budget than any other province, with the exception of East Kalimantan. Also much of their land has been taken over by plantations which are springing up around Riau. Burning of forests and swamps to open new land occurs every year. Because of this, there is a need to work together closely with the Riau Malay community to increase their understanding of economics, the law and sustainable environmental conservation techniques.